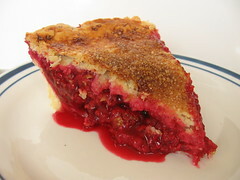 Double-Crust Deep Red Raspberry Pie - Do You Know The Muffin Man? Notes: I got a deal at the farmer's market on four pints of raspberries, nearly the last of the season. This pie crust gave me a bit of trouble as it cracked a lot during rolling, but I kneaded the top crust a bit more and it held together much better. For the liqueur, I used Southbrook Winery's Framboise. 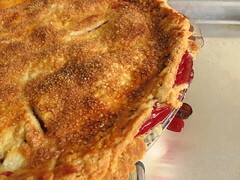 What a great pie, brimming with berry flavour and the raw cane sugar on the top made a crunchy, sweet topping.